I began to wonder about the state of grace yesterday afternoon. I was taking my mom home who wasn’t feeling well at all. We had a very long trip to the hospital and it involved hours of driving. As I was turning off a stretch of remote highway I saw what appeared to me to be a Buddhist Monk walking on the edge of the highway in his bare feet. It was a scorching day in the prairie sun, miles from anywhere and he appeared to be a mirage. 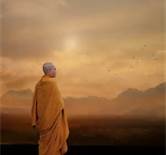 His head was shaved and he moved with grace, the flowing saffron robe he wore gave the impression of coolness and a disconnect of his surroundings. I slowed down and the wave he gave me signified, please keep going, do not stop. My Mom responded with “He knows us, but we don’t know him”. I thought it was a very odd remark for her to make. I wondered about the brilliant color he wore and researched it on the internet.. “The original monks made their robes from discarded cloth found in rubbish heaps and on cremation grounds. After washing, the robe cloth was boiled with vegetable matter — leaves, roots and flowers — and often spices, which would turn the cloth some shade of orange. Hence the name, “saffron robe.” Monks today wear robes made of cloth that is donated or purchased, but in Southeast Asia the cloth usually is still dyed in spice colors”…His shaved head often symbolizes the renunciation of worldly things. It helps monks over-come vanity to embrace the simple life of a monk. His colors were the same as the sun which radiated warmth, light and optimism. I felt humbled as I watched him fade into the black horizon of highway and I could only wonder and admire his state of grace as we crossed paths that afternoon. This entry was posted in love and poetry and tagged Buddhist monk, journey, state of grace. Bookmark the permalink. What a thought provoking sight in the middle of the prairies Estee! very disconcerting it must of been. A sign of some sort?